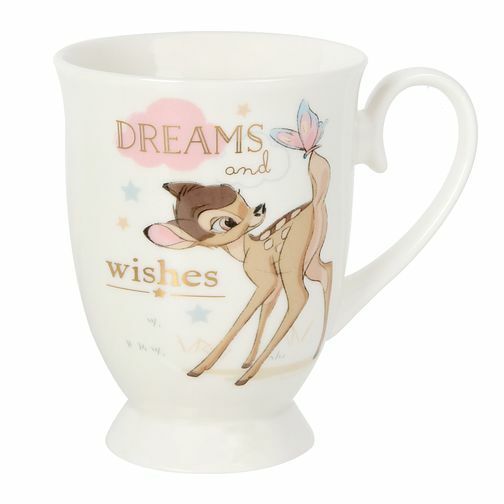 Celebrate those magical Disney moments with this Dreams & Wishes Bambi mug gift set. Decorated with one of the most iconic Disney characters of all time and coming in a beautiful cylindrical gift box, this mug is the perfect present for any Disney fan, or simply to treat yourself. Disney Magical Moments Bambi Dreams & Wishes Mug Gift Set is rated 5.0 out of 5 by 3. Rated 5 out of 5 by Anonymous from Perfect Gift I bought this mug as a Xmas gift for my work colleague, I ordered online and it arrived within days in a beautiful box. Its the right size for the perfect cup of tea. The style and quality of the design is excellent. I would highly recommend to all Disney fans who love a good cuppa! Rated 5 out of 5 by Anonymous from Good quality The mug set arrived quickly in store. Exactly as described. Perfect gift for a Disney fan.